Shown from left are Ahresty blood donors: Brian George, 41 units; Marty Bickett, 27 units; JC Gilmore, 27 units; Gabriel Hughes, 5 units; Dennis Chaney, 41 units; team chairperson Fadi Al-Ghawi, 153 units; Sherry Barrett, 13 units; Donor, Mike Frazier, 28 units; and Wanda Shibley, 21 units. WILMINGTON — The Ahresty blood donor team members continued to be passionate about their blood drive events that they hold throughout the year at their facilities. In 2018, they held four blood drives with an average of 37 donors per drive. 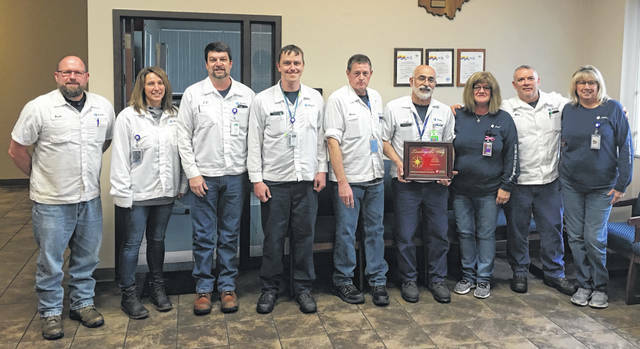 Once again, they were the recipient of the Platinum Award, which they have received for several years in a row for meeting 100 percent or greater blood drive efficiency. Members of the team always encourage others to donate for a good cause; every pint of blood will save three lives. If you are interested, please contact the Community Blood Center of Dayton at 937-461-3450 or visit www.GivingBlood.org.